Meetup works across thousands of cities. Its aim is to help bring together groups of people that have common interests. By signing up, you can immediately check out what your local area has to offer. Whether it’s simply a group full of people of a similar age, or a keen bunch of tech or fitness fans, there should be something for you. Want to get to know your neighbors more easily but never seem to run into them? Nextdoor is the perfect alternative. It’s a private social network for your neighborhood, allowing you to exchange information on the local community through your smartphone. It’s ideal for making first contact with your new neighbors, plus you can keep on top of local recommendations or classified ads. Bumble might be most famous for being a dating app, but it offers more than just romance. You can tweak some settings specifically to look for new friends in the same way that you’re looking for a date. It’s ideal if you want new people but not more romance. Peanut is an app that hopes to build a community of women who also happen to be mothers. You can spend time in the app chatting via a group chat facility, but Peanut has a strong focus on arranging meet ups. It’s ideal if you’re worried about being isolated while on paternity leave, as well as great for gaining advice. 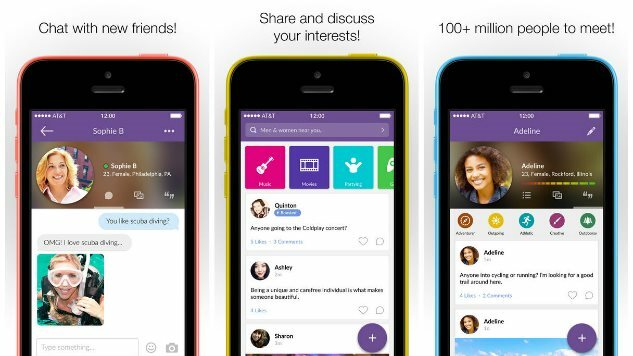 Skout works on preferences and proximity, much like a dating app but for friends. You can use it to meet new people, no matter where you are, even if you’re just visiting a new area. You can gain updates from nearby users, buy and send gifts for them or simply see who’s checking you out. It’s ideal for those who travel regularly but want to meet people. Nearify touts itself as an app for letting you know of events happening near you, but it’s also a cool way of meeting new people. You can easily check out what events your friends are liking or attending, as well as keep in the know about when your favorite musician or comedian is around. Personal recommendations make it easy to find something to do any day of the week. Dog walkers know how easy it is to randomly talk to people while walking their pooch, but Meet My Dog just made it even simpler. You can easily use it to see what other dogs are in your area, chat with their owners, and event set up doggie dates for you and your hound. Foursquare is a well known name in social networking, but you can also use it to get to know folk. Its City Guide helps you find the best restaurants and bars in the area, while also giving you some insight into where like minded folk might reside. Sure, you’ll still have to go up and say hi but it could be worth it. Meeting one on one can be a little intimidating so how about if there were three of you? That’s the thinking behind Me3 which is gradually spreading from city to city. Offering group chats with users of the same gender, its smart algorithm pairs you with like minded people, allowing you to get to know each other safely. MeetMe offers over 100 million people chatting, covering all ages, nationalities and backgrounds. In which case, you should be able to find someone who shares your interests. You can start the conversation via a form of status update giving people an insight into your life, before delving further into things and maybe even making a new friend.